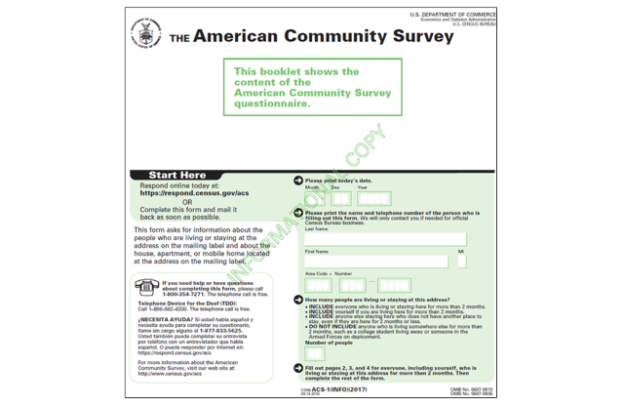 2018 American Community Survey Form	(www.census.gov). At the beginning of the year the United State Census Bureau released updated results from the American Community Survey, a massive continuous survey project the bureau undertakes between censuses. With redistricting coming up in 2021 it’s perhaps worth checking in on the updated ACS numbers to see what’s been going on in Minnesota and how that will effect the next set of maps. For reference, I’m looking at the 5-year estimates, so the survey data spans from January 1, 2013 to December 31, 2017. The overall population of the state of Minnesota has increased by over 185,000, from just over 5.3 million to ten thousand short of 5.5 million. That means the population target for a Senate district would be almost 82,000, a house district just over 40,000. It’s probably not hard to guess where that growth is occurring, but would you be surprised to learn that 88% of that 186,801 increase happened in the seven counties that make up the metro, Anoka, Carver, Dakota, Hennepin, Ramsey, Scott and Washington. The uneven growth so far this decade has lead to the metro adding one Senate and one and a half House seats in the next set of maps. What becomes clear looking at these numbers is how damaging it is for Republicans future prospects in Minnesota if the suburbs continue to behave like they did in this last election. Below is a table of all 87 counties for anyone who’s curious. UPDATE: The last column is the % of the statewide change, not the percentage change from 2010. I’ve updated the label of the column. Thanks to those who pointed it out.